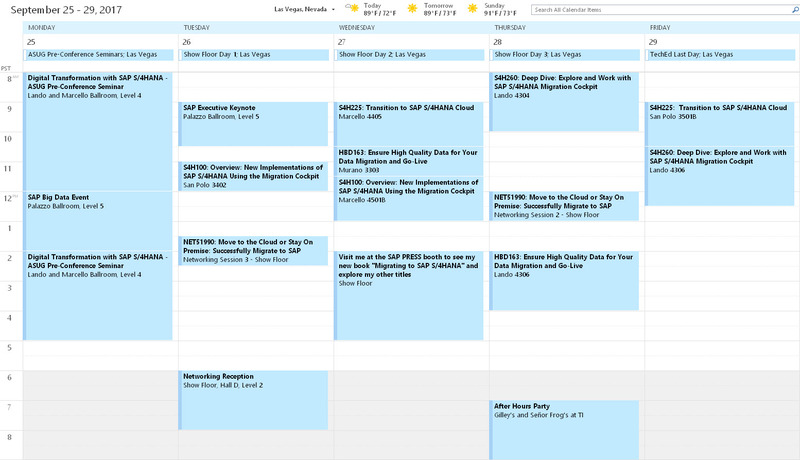 SAP TechEd 2017 Las Vegas: What does Your Agenda Look Like? There is only one week to go until SAP TechEd Las Vegas, time to plan your visit. I’m one of The Data Migration Guys and I will be in Las Vegas to answer all your questions on Migrating to SAP S/4HANA. I’m conducting a bunch of sessions on this topic including both lectures and hands-on sessions. All of them will be very interesting but Transition to SAP S/4HANA Cloud will be great to get to know SAP’s intelligent ERP in the Cloud. Catch me at one of my sessions or at the SAP PRESS booth to check out my new book Migrating to SAP S/4HANA and get a discount after you talked to me. I’m also happy to sign copies after you purchase them. Click here to open my schedule in the SAP TechEd Agenda Builder or scroll down to view it now. PERS1260 PRE51066: Journey to S/4HANA Pre-Conference 08:00 a.m. – 05:00 p.m.
SIA43 SAP Big Data Event Special Interest Activity 11:00 a.m. – 01:45 p.m.
SAP Executive Keynote: Björn Goerke Keynote 09:00 a.m. – 10:30 a.m.
S4H100 Overview: New Implementations of SAP S/4HANA Using the Migration Cockpit Lecture (1hr) 11:00 a.m. – 12:00 p.m.
NET51990 Move to the Cloud or Stay On Premise: Successfully Migrate to SAP S/4HANA Networking Session (30min) 01:30 p.m. – 02:00 p.m.
S4H225 Transition to SAP S/4HANA Cloud Lecture (1hr) 09:15 a.m. – 10:15 a.m.
HBD163 Ensure High Quality Data for Your Data Migration and Go-Live Hands-On Workshop (2hr) 10:30 a.m. – 12:30 p.m.
S4H100 Overview: New Implementations of SAP S/4HANA Using the Migration Cockpit Lecture (1hr) 11:45 a.m. – 12:45 p.m.
PERS1262 SAP PRESS Booth Meet the Author 02:00 p.m. – 05:00 p.m.
S4H260 Deep Dive: Explore and Work with SAP S/4HANA Migration Cockpit Hands-On Workshop (2hr) 08:00 a.m. – 10:00 a.m.
NET51990 Move to the Cloud or Stay On Premise: Successfully Migrate to SAP S/4HANA Networking Session (30min) 12:00 p.m. – 12:30 p.m.
HBD163 Ensure High Quality Data for Your Data Migration and Go-Live Hands-On Workshop (2hr) 02:00 p.m. – 04:00 p.m.
S4H260 Deep Dive: Explore and Work with SAP S/4HANA Migration Cockpit Hands-On Workshop (2hr) 10:30 a.m. – 12:30 p.m.